We don't need to write much code for chat apps any longer. Over time, we have utilized Channels to build our awesome chat apps. But we had to write most of the logic ourselves. We had to set up a database to store chat messages, write code to know when a user is online, know when a user is typing and many other chat features. It's entirely different using Chatkit. By default, Chatkit brings out of the box most of all those features we needed to write ourselves. In this two-part series, I will walk you through building a chat app using Chatkit. Along the line, we'll build a customer live support app. The app will help us interact with our customers so we can respond to their needs. We'll use the Symfony PHP framework for the backend while Vue handles the frontend DOM rendering. Part one - we'll go through a step by step approach to set up a Symfony and a Vue.js app. Here, we'll make sure your machine has the basic requirements. Part two - we’ll design and build up the user interface, set up Chatkit and make sure the app works. To follow along with this tutorial, you should have a basic understanding of the PHP language. Knowledge of the Symfony framework is not entirely required. I will assume you have some knowledge of Vue.js otherwise you can go through the basics on the doc to get you up to speed in a couple of minutes. This should print out the version of PHP you have installed, otherwise, you need to install PHP. We are using Symfony 4.1 to build this app which requires PHP 7.1.3 or higher to run. If the command does not print out the version of the composer that you have installed, this means you need to install Composer. You can do that here. $ composer create-project symfony/website-skeleton . This will download some dependencies into the project folder and generate the basic directories and files we need to get started. Do not close the terminal so that we can be observing changes while we build along. To start using Chatkit, we need an API key. Register an account if you don't have one already, otherwise log in to your dashboard. Clicking the CREATE button in the CHATKIT area to create a new instance. You will get a popup. Fill in the name of the instance as “live-support” or any name you prefer. Then submit the form by clicking on the CREATE button. After submitting the form, you will be taken to a new page where you will find your ChatKit credentials. Make sure to replace YOUR_CHATKIT_INSTANCE_LOCATOR and YOUR_CHATKIT_SECRET_KEY placeholders with their actual values. We want to be able to use this key within our Vue component without adding the key directly to the code. Make sure to replace YOUR_CHATKIT_INSTANCE_LOCATOR placeholder with the actual value. The next thing we'll do now is to add Vue to the project. Webpack encore is a simpler way to integrate Webpack into Symfony applications. We enabled the Vue loader by adding the *. *``enableVueLoader() line so that any .vue file can be compiled. Don’t close the terminal, so that all changes we do to the .vue files will be picked up and updated automatically. For the app, we'll have two pages. A page for clients that everyone can access to chat and a page for admin which is limited to only admins. Client.vue. This will be the main component that will house all other components, which will make up the client facing view of the app. Admin.vue. This component will accommodate all component that will constitute the admin page. First, create a folder named components in the assets/js folder where we'll put all our Vue components. Then, create two new files named Admin.vue and Client.vue in the components folder you just created. In the code above, we first imported Vue. Then, we require the two component files we created and named it chat-app and admin-chat respectively. If we need to add the client view, we’ll add <client-chat> </client-chat> to the HTML file where we want it to show likewise admin-chat. Finally, we created a Vue instance to target an app element in the body of the HTML. And that’s it! we are now ready to start building our chat application. In the part one of this tutorial series, we have been able to set up our working environment for the project. We added Symfony and Vue to the project. While Symfony takes care of the server side job, Vue will sit on the frontend to handle DOM manipulations. 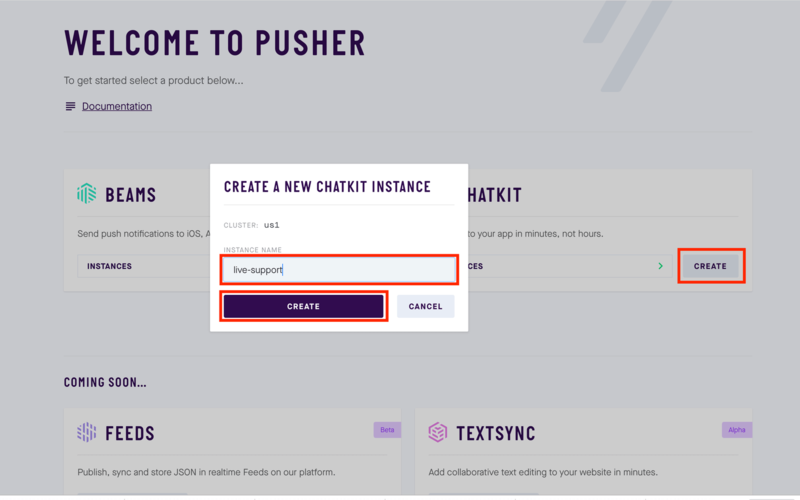 In the second part of the tutorial, we'll build the full app and go through Chatkit features for building the chat application.